The inner aspect of each upper and lower eyelid has a little tear drainage hole (referred to as a “punctum”). This can often become narrowed (this narrowing is referred to as “punctal stenosis”). This is a common cause of impaired tear drainage resulting in watering of the eye (a watery eye or overflow tearing). Punctal stenosis can be corrected by performing a “punctoplasty”. A “punctoplasty” is a short procedure performed after giving a local anaesthetic injection into the inner aspect of the eyelid. The narrowed punctum is widened using either a “Kelly punch” instrument or with a dilator followed by the the temporary placement of a perforated punctal plug or a Crawford silicone stent, particularly if both the upper and lower puncta are affected. For the anxious patient the procedure can be performed using “twilight anaesthesia”. A perforated punctal plug is a very small specially designed silicone plug with a drainage hole that is inserted into the narrowed punctum for a period of approximately 6 weeks whilst the underlying cause of the problem is treated (e.g. 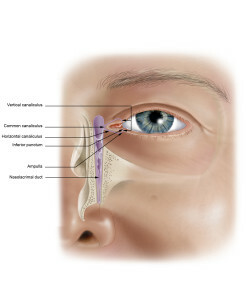 simple daily lid hygiene for the management of blepharitis or surgery for an ectropion repair correcting the eyelid position and returning the punctum to its normal position). After removal of the perforated plug the slightly enlarged punctum can drain tears more effectively. These treatments are very effective for the vast majority of patients. To learn more about Punctoplasty, please contact us at today to schedule an appointment.